There are numerous ways to assess the performance of a native advertising campaign. Here are five of the most important metrics, along with quick definitions and context on when they're appropriate to use. Engagement: Did users click on links, leave comments, or share content on social media? Engagement helps advertisers gauge how readers reacted to content and whether it reached its campaign goals—to educate or entertain, for example. Click-Through Rate and Cost-per-Click: How many people clicked on the ad or the link, and what did each click cost you? Reporting on PubNative data, the Mobile Marketing Association notes that CTRs for native mobile in-app ads were six times higher than those for nonnative content. Brand Lift: Is there a difference in brand awareness levels before and after viewers see the ad? When a brand is using native content to help get the word out about their products, or improve overall brand positioning, measuring brand lift provides a quantitative metric for success. Completion Rate: When referring to video ads, it's helpful to see what percentage of viewers completed viewing the ad. As Nativeadvertising.com suggests, this metric looks at what percentage of the total audience completed viewing video content. This helps differentiate viewers who took action (and watched the ad) from static impressions. Conversions: After seeing the ad and clicking through, did customers take the next desired action, such as making a purchase or signing up for an email newsletter? Ultimately, this helps brands measure campaign success in real-world terms. When you buy native ads, publishers provide some insight into metrics around native advertising performance. While this is a great start, there are two potential limitations. One is that you can't customize the metrics you're tracking to fit your campaign goals, and the second is that you lose information once the person clicks on a link. For example, a brand might invest in a major ad campaign and use publisher metrics to track click-through rates, on-site brand lift, and engagement. Yet, without their own supplemental measurement, brands won't know what happens on their own site. Do these leads turn into customers? Implement a metrics solution with trackable links back to your own site so you can get a better picture of the full life cycle, better understand conversions, and track leads from native ads into your sales funnel. It's possible to measure every aspect of a campaign's performance, however, data is meaningless without context. Instead, decide what you're trying to accomplish and which metrics could help you determine success. For example, Laughing Cow conducted a sponsored content initiative on Buzzfeed. The article featured the world's cutest cows and received plenty of clicks and 20,000 shares (according to Digiday's citation of Nudge Analytics data)—but what did it tell them? CTR, even supported by social metrics, doesn't necessarily provide a good indication of a campaign's performance. If the brand's goal is to raise awareness of its name in the market, measuring brand lift and tracking related brand mentions online may provide better indicators. Determine your campaign goals and then compile a list of the metrics that work best for you. 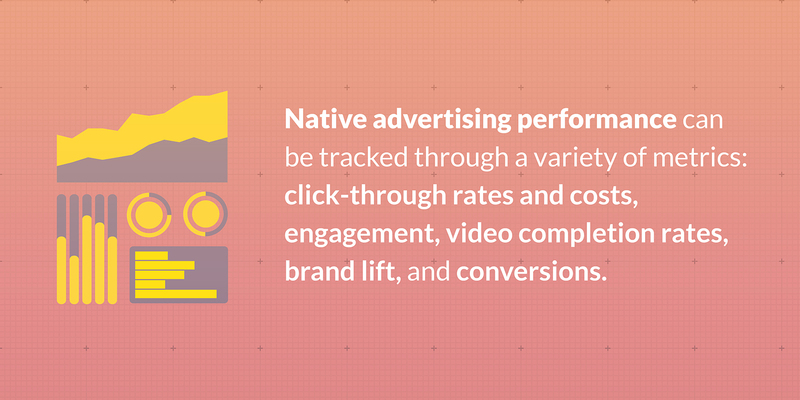 Consider several interrelated metrics to better assess native advertising performance. The popularity of native ads is rising, as consumers become more sensitive to ads that interrupt their online browsing experience. By focusing on the right metrics, advertisers can develop a better baseline for evaluating performance and investing their time and funds in native campaigns that resonate with their target audience. 1. Native advertising performance can be tracked through a variety of metrics: click-through rates and costs, engagement, video completion rates, brand lift, and conversions. 2. Publishers provide campaign metrics, but brands should look for holistic platforms that measure engagement performance post-click for a full view of campaign results. 3. Your performance assessment should be tied to your goals—it's possible to measure every aspect of a campaign's performance, but the only data that matters is the information that's linked to your business objectives.